Horrendous photo at left from my spring fly collection. 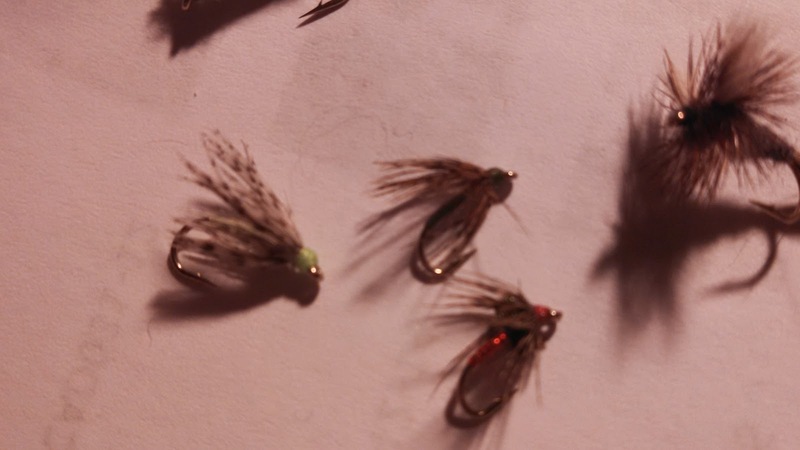 These are three soft hackles (called spiders in the U.K.) and a franken-fly: an Adams Wulff. It doesn't look like any specific bug but trout do not seem to care. I stand in cold water to catch fish by the most difficult manner possible (yes, it is easier to fish by hand than with a fly rod - noodling is easy compared to achieving a dragless drift in fast current). This is us, comrades. We struggle, toil, procrastinate, doubt, contemplate, regret, and revise. Others just write. There seem to be nearly as many books and prophets selling quick tricks to success as a writer as there are successful living writers. That indicates something in itself about the task. In the end, we're storytellers. We do it well, the audience listens and quietly motions for another drink instead of guzzling beer and breaking into bawdy songs over our best efforts. I struggle with fly fishing. I fish too often to selective fish on technical waters at the wrong time of day (my fish are almost all nocturnal). There are easier places to do it. There are easier places to fish. I'm drawn to this pursuit. I can't help myself. I'm hoping now in my spring fly order I have the "magic" fly that I'll be able to put on the water at the right time in the right way for the 25" brown trout to consume. I'm looking for the magic verb to remove all of my supporting adverbs and help a weak,text become stronger. Practice is needed daily on both fronts. I hope you are writing. If you want to go fishing sometime and are near Michigan, let me know. My favorite "not writing" activity is "not catching fish." Both pursuits benefit from a well told lie. 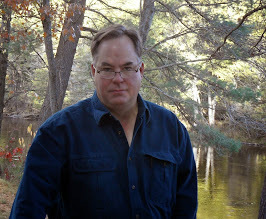 After all, I write fiction.